This 5 day trip to the beautiful Isle of Arran has been put together for anyone who would like a little adventure, experience some truly stunning scenery, meet some great people and to learn new bushcraft skills, or test out existing ones, in a variety of habitats. This certainly includes us! The Isle of Arran has been described as ‘Scotland in miniature’ and has rugged granite peaks in the north and rolling hills, glens and large coniferous forests to the south; the coastline varies from sandy beaches to sheer cliffs. This tremendous variety of habitats (and weather!) will allow you to really hone those bushcraft skills. For this expedition to the Isle of Arran we’ll be working closely with Mark Bunyan, lead instructor at Arran Bushcraft & Survival. Our base camp is in Stronach Wood, high above the village of Brodick, with views to mainland Scotland in one direction and to Goat Fell (the highest peak on the island) in the other. We’ll be taking in a wide variety of habitats including coniferous, broadleaf, mountains, moorland, beach, burn and estuary. Sharpen your knife so it can easily slice through a sheet of paper. It would be a pity to travel to Arran and not see as much of it as possible, so we’ll spend a day exploring the island by foot and take in some of the stunning scenery of north Arran. Bring a towel for a swim in the Blue Pools of Glen Rosa! By making a booking you confirm that you agree to our Terms and Conditions. You can see all of our course dates here. Location: Isle of Arran, Scotland. You can get to the Isle of Arran by Cal-Mac Ferries from the port of Ardrossan (a train connection is available from Glasgow Central Station); ferries run regularly and the crossing takes 55 minutes to Brodick. It is cheaper to park your car in Ardrossan than it is to bring it on the ferry to Arran, but we can park up a couple of cars at the site. Catering: Fully catered, although we’ll all need to help out with the cooking and washing up. You might also find these Frequently Asked Questions useful. Having only attended bushcraft courses in Kent and Sussex it was a fascinating and really valuable experience to learn about the challenges of practicing bushcraft in a different climate and a different type of woodland to what I was used to. Gary was as usual an extremely knowledgeable and enthusiastic instructor, and Mark's local expertise was really valuable, as well as all of his knowledge of navigation skills from his work for Arran mountain rescue. The camp is in a lush, mossy pine plantation with acid soils, with a very different range of plantlife from chalky Kentish woodland, and we got to explore different Arran landscapes like the rocky coast and Glen Rosa's valleys and pools, seeing some fascinating bird behaviour on the way! There is also some curious prehistoric cup-and-ring rock art by the campsite. The catering was excellent as always, and the course was very accommodating of the difficulties of catering for coeliac disease. Arran trip was the best ! Beautiful location and amazing wild life deers & eagles . 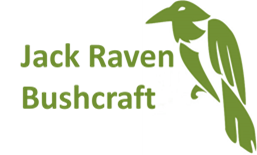 Thanks to the jack raven team for making the visit so memorable. I would thoroughly recommend this course to anyone looking to practice their bushcrafts skills in a new environment and experience some adventure. The scenery is magnificent and the wildlife incredible. Mark, Gary and Nicola were extremely knowledgeable and keen to share this with everyone. The food, as always, is amazing, and when your finished, there are plenty more activities on the Island to keep you busy for days. It's just a shame I couldn't stay longer. I had such amazing time on Arran. It was fantastic and seeing an eagle chasing a red deer stag is something I’ll never forget. All the people on the course was great and we all got on so well including Willow. Gary and Mark’s knowledge and teaching skills are superb. The food was out of this world thanks to Nicola. Thouroughly enjoyed my week’s bushcraft course on the Isle of Arran, it was very informative and a great bunch of people. Many thanks to our instructors Gary and Mark and also the great food prepared by Nicola. Not forgetting Willow the dog who kept us entertained. Looking forward to coming on another course sometime soon.